This BBQ Bacon Burger has bacon and cheese mixed into the actually burger meat… but it’s the crispy fried onions and the BBQ sauce on top that really make it worth cooking. Out of all the burgers I have been trying and cooking lately, this one is easily one of my favorites. And really, it’s pretty easy to make. It takes a basic grilled burger and puts it in the gourmet burger status. First cook your Bacon until done… but not too crispy. Reserve the bacon drippings for later – you are going to use this to cook your crispy onions. Drain your bacon well on paper towel and chop or crumble into pieces. In a bowl combine 2/3 lb Ground Chuck with bacon pieces, a hand full of small cubes of Monterey Jack Cheese, chopped green onion, and 2 Tablespoons of Worcestershire Sauce. Also season with Seasoned Salt, Black Pepper, and Garlic Powder to taste. Next I mix the meat really well and form 2 equal size balls. Place the balls (mixed with all your add-ons) back in the fridge for a quick chill. If you have ever had a problem with a burger you have “mixed” with other ingredients not wanting to stay together, it’s because everything got too warm and started separating. I’ve found that keeping the burgers as cold as possible helps them stick together best. And it’s a good idea to roll your burgers into balls and then place them in the fridge before you every patty them out or place them on the grill. This allows everything to come together and will keep your “mixed” burger from falling apart. Prepare the grill for Medium High Heat, and press the meat into patties. Place the burgers on a well greased cooking grate and let cook for 4-5 minutes. Check the burgers to see if they’re seared on one side. Flip to the opposite side and continue cooking for 4-5 minutes. The burgers will be done in 8-10 minutes total cook time. But you want to rest them for at least 5 minutes after removing from the grill. Heat the bacon drippings over medium heat, slice an onion super thin and dredge in egg/milk bath then flour. Fry the onion rings in the bacon fat until crispy. This should only take about 2 – 3 minutes… and these little crispy fired onions are amazing on this burger. I simply take our homemade BBQ sauce (because that is my personal favorite) and mix it 3 parts BBQ Sauce to 1 part steak sauce. I put this in a small boiler and mix it for a few minutes while it is heating on the stove. This just makes sure these two ingredients are well mixed and makes sure you aren’t putting cold BBQ sauce on your burger. Place the burger patty on a toasted deli style bun. 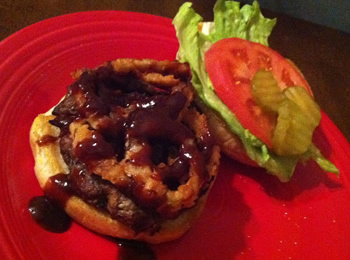 Top with Crispy Onion Rings and drizzle with your favorite bbq sauce. I also served them with Lettuce, Sliced Tomato, and Dill Pickle.